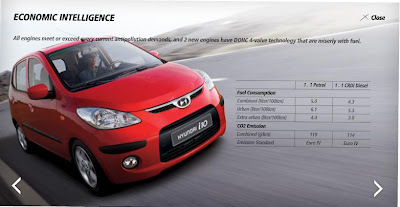 2009 Hyundai i10 Diesel is going to be the smallest diesel car in India. This car is going to be powered by 3 cylinder 1.1 litre CRDi engine. This car is expected by mid of 2009. The new engine and transmission system for i10 diesel is manufactured at Hyundai’s Chennai plant. Hyundai i10 diesel is going to be another best seller car from Hyundai as Indians love diesel car and if that is a variant of hot selling i10 then nothing like it. The car is expected in the mid of 2009 and will be priced at around 5.2 to 6.4 lakhs.